It can be expensive and time consuming to transfer large amounts of data to the cloud. As opposed to taking weeks or months, you can affordably transfer up to 120 TB of data in as few as 7 days using Mass Data Migration. You need to secure sensitive data, but want to avoid upgrading your networking environment and connection speeds during data center downsizing, expansion or relocation. 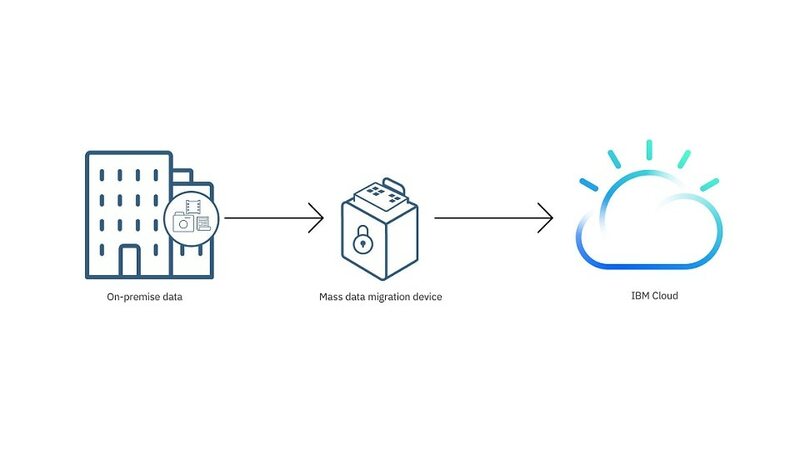 Accelerate your data center transformation and use Mass Data Migration to securely move your sensitive data to the cloud as you downsize, expand or relocate your data center. You want to transfer data to the cloud from a remote or low-bandwidth area where high-speed internet connections are unavailable or cost-prohibitive. 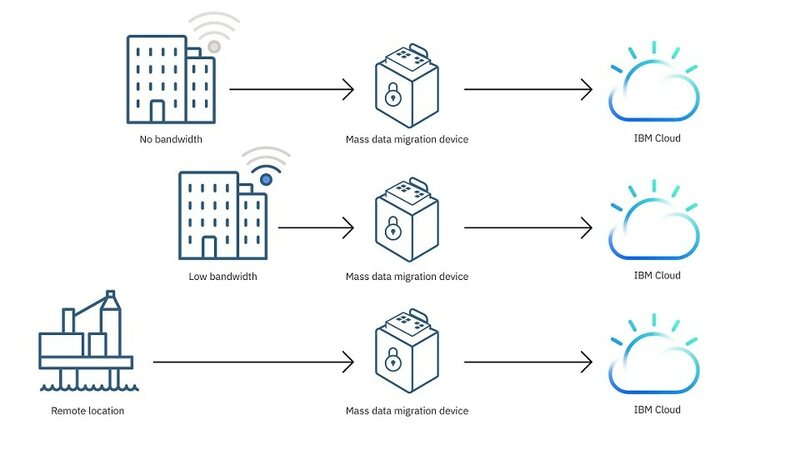 Mass Data Migration can be used regardless of bandwidth availability. 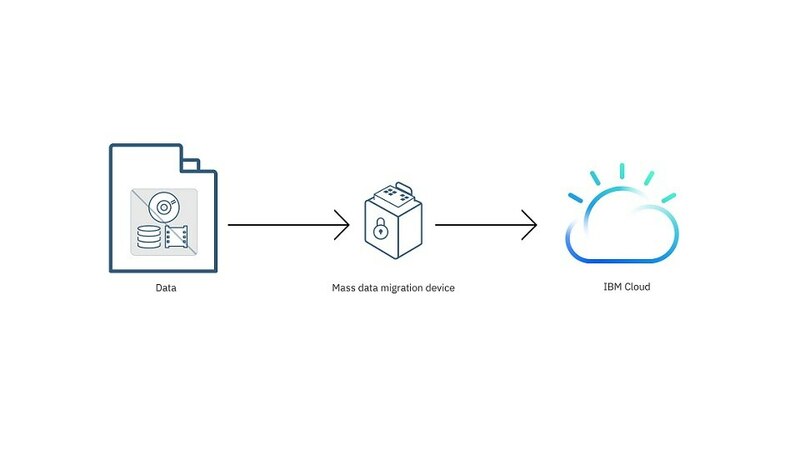 IBM Cloud Mass Data Migration offers devices with a storage capacity of 144 TB with a usable capacity of approximately 120 TB at RAID-6. Data and network connections are 2x 10Gbase-T and 2x 1Gbe. Devices support RJ45 and SFP+ copper. RJ45 to SFP+ converter is included. Device dimensions are 21.7 in. x 13.7 in. x 19.3 in. without case and 25.6 in. x 17.3 in. x 22.8 in. with soft travel case. Weight is 56.5 lb without case and 66 lb with soft travel case. Device is equipped with wheels and pop-up handle. The device is also accessible while in the soft travel case. Thermal specifications are 41°F to 95°F with lid fully open. Operable with humidity of 90 percent with lid open. Maximum operable altitude is 13,000 ft.
Waterproof: Lid open - up to 1 minute. Lid closed - up to 30 minutes.